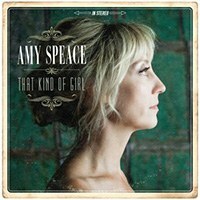 Amy Speace’s latest album is one that has the potential to take her over the top. With five acclaimed albums to her credit, Amy Speace is quickly approaching a high plateau in terms of her artistic stature, arriving at that juncture touting some serious gravitas, having spent a number of years performing Shakespeare on the New York City theater circuit. However as soon as she opted to make music her main focus, she garnered the immediate attention that eluded her before. Judy Collins covered her song “Weight of the World” and not only invited Speace to join her on tour, but also signed her to Wildflower, her very own record label. New York radio station WFUV named “Weight of the World” “The No. 4 Folk Song of the Decade”, and National Public Radio spotlighted her music on their popular program All Things Considered. Comparisons to Lucinda Williams and Roseanne Cash soon followed. Speace’s last album, How to Sleep in a Stormy Boat (along with its companion EP Same Old Song) brought her the best notices of her career and took her to an array of high profile venues, including Mountain Stage, Music City Roots, and the Kerrville and Philadelphia folk festivals, and while she’s yet to become a mainstream star, it’s also evident that Speace is teetering on the verge of wider recognition. All of which leads to That Kind of Girl, Speace’s latest album and the one that has the potential of taking her over the top. In many ways, it’s an unassuming effort, with a predominance of pretty ballads (“That Kind of Girl”, “One Man’s Love”, co-written with Ryan Culwell and Beth Nielsen Chapman, respectively) and softly swaying pop songs that restrain the rhythm without varying the pace. The best songs of the set – the modestly assertive “Better Than This” and “Hymn for the Crossing", the feisty “In Chicago” and the slow, sultry moan “Three Days” – provide a much needed respite, elevating the album into more compelling terrain. Any passive approach could be attributed to producer Neilson Hubbard, a musician whose signature sound tends to settle into a kind of hazy malaise and airy atmospheric. However, with increased demand for his services in recent years, Hubbard has traded that technique for one that provides increased clarity and perspective. Speace’s vocals – sometimes teasing, but always engaging – add character and charisma, with songs that allow her to weigh in with the kind of verve and vitality capable of connecting her with the larger audience she so decidedly deserves. The combination of those factors makes That Kind of Girl a remarkably strong album, and if Speace sometimes tends to downplay her delivery, she also shows a confidence that suggests less is more, at least in terms of effecting a pivotal performance. There are plenty of examples of that – any of the aforementioned songs certainly qualify – but even limiting the evidence to a compelling narrative like “Trouble Looks Good on You” ought to prove the point. It’s that kind of album and clearly Speace is, as the title suggests, that kind of girl. And hopefully, as time goes on, this will prove to be the kind of album that will make her some kind of star.